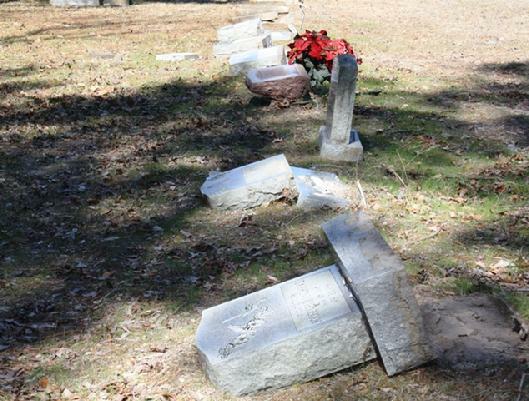 Arrests Made and Confessions Received in Cemetery Vandalism Crime, ONALASKA, February 17, 2010 - The Polk County Sheriff's Office was contacted and began receiving tips from Crime Stoppers after the story of the vandalized cemetery was published on PolkCountyToday.com. Detective Richard Delaney (who was assigned the case) went to Onalaska School District following up on a crime stoppers tip. During the course of of Delaney's investigation with juvenile suspects, Delaney made three juvenile arrests. The juveniles were transported to the Polk County Sheriff's Office where confessions were made. All three juveniles were charged with Felony Criminal Mischief. The investigation is still in progress with charges pending against another juvenile. 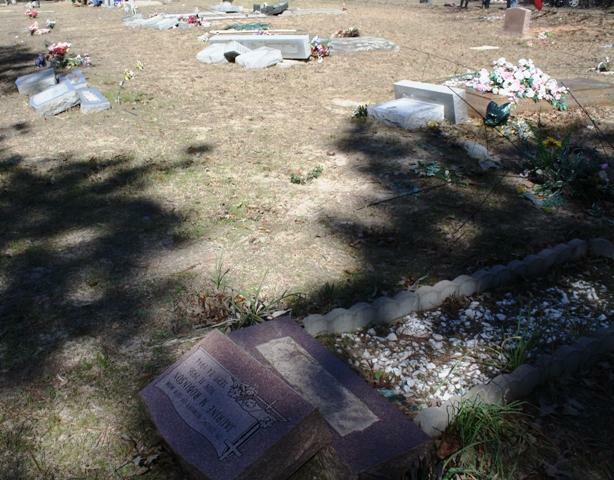 Investigators Search for Clues Into Cemetery Vandalism, BLANCHARD, February 16, 2010 - Vandals defaced and destroyed property at a cemetery located off of Yarbrough Loop near FM-3126. The evil deeds took place sometime in the middle of the night between February 15 and the morning of the 16th. 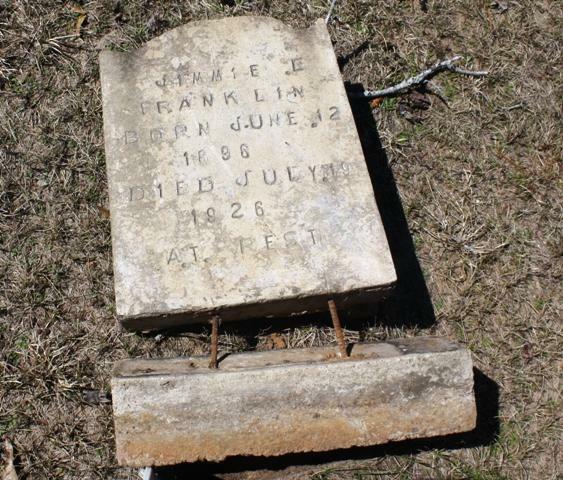 The damage (estimated to be thousands of dollars worth) was discovered in the morning by a cemetery visitor who went to visit the grave of a loved one. The vandals pushed over nearly every headstone in the Corvelle Cemetery that's been around for over 100 years. 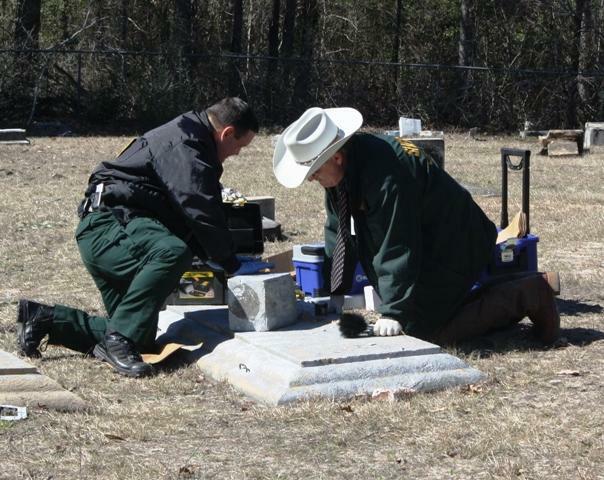 Detectives from the Polk County Sheriff's Office did a complete grid search of the entire cemetery and gathered forensic evidence including dusting for fingerprints. Investigator Richard Delaney said that he's never seen anything like it. Only three months earlier a small chapel just a few feet away from the cemetery burned down. Investigators do not yet know if the two are linked. 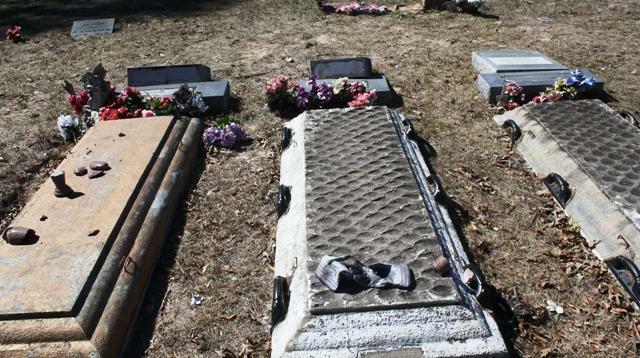 Family and loved ones gathered at the cemetery but couldn't understand why somebody would do such a thing. Corvelle is a cemetery of people of color, however, Delaney stated that they don't yet know if the destruction is racially motivated. 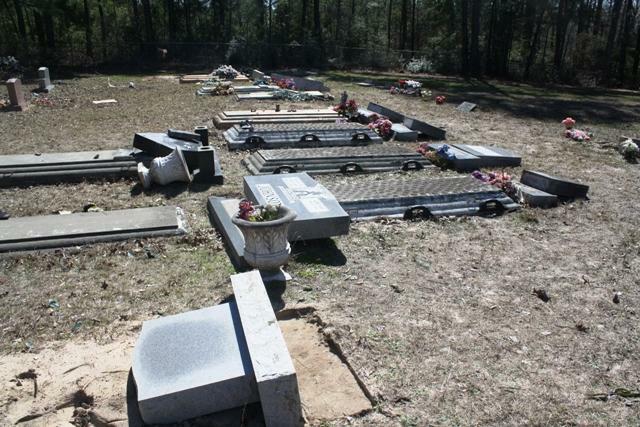 Polk County Crime Stoppers will pay up to $2,500 for information leading to the arrest and conviction of the person(s) responsible for this crime. If you know anything, please contact the Polk County Sheriff's Office. Click here for a video report and interview with lead investigator, Richard Delaney with the Polk County Sheriff's Office. 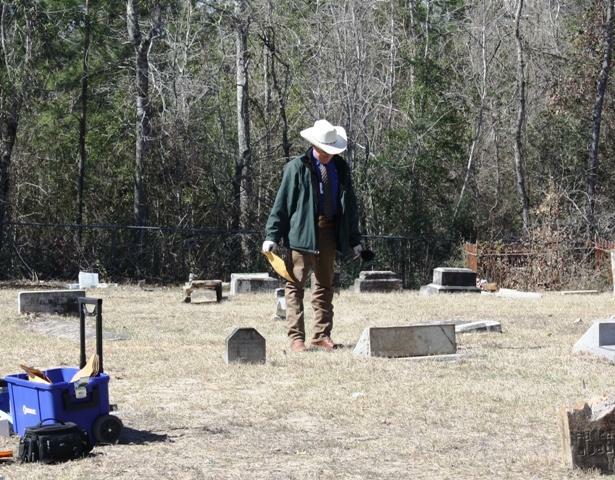 Investigators from the Polk County Sheriff's Office searched every inch of the cemetery for evidence. 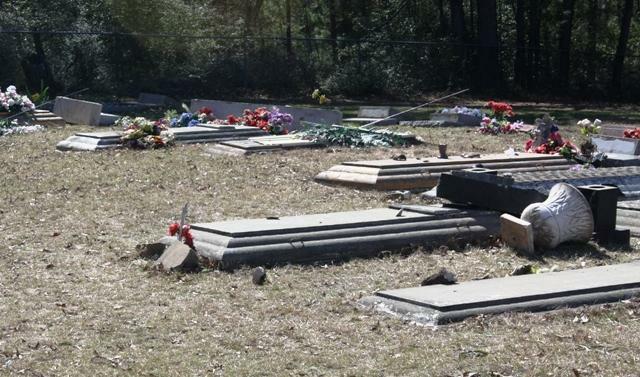 Vandals pushed over nearly every headstone breaking many of them and pushing over and breaking ornamentals. 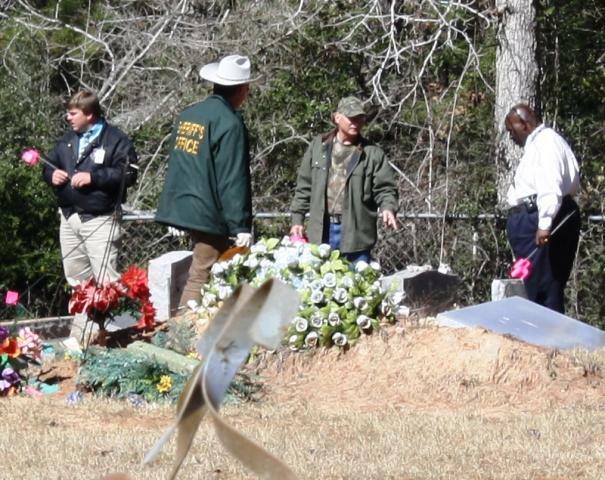 Investigators Phillip Waller (left) and Richard Delaney with the Polk County Sheriff's Office gather forensic evidence. Just a few feet away from the cemetery charred remains are all that's left from a small chapel that was burned down only 3 months earlier. Investigator Richard Delaney with the Polk County Sheriff's Office investigates.